Peaced Together has helped me to overcome issues from the past. I am confident to move forward and be more positive in the future. I now believe in Hope. Peaced Together has helped me see positives in negatives. I have overcome issues from the past and am not so broken. I would like to continue to be more creative. The next course will be starting in September 2019. 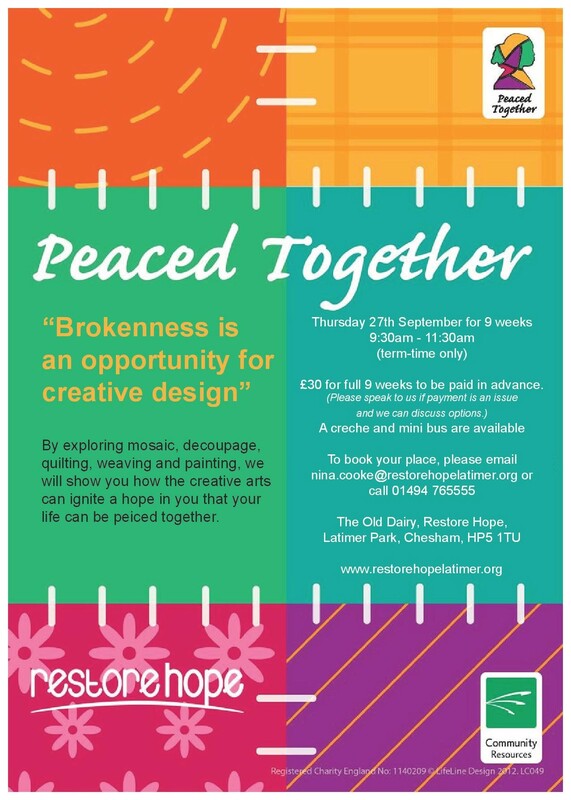 Peaced Together is a 9 week creative arts course that believes that good can come from negative and difficult experiences. Using craft projects, Peaced Together encourages women to reflect on their lives and set out on a personal journey from brokenness to hope. Each project explores topics such as beauty, peace with the past and positive choices. All the craft projects are very different, so you will learn new skills using a wide range of materials and techniques. The projects range from sewing cushions to creating mosaics. Each finished piece will look very individual as everyone expresses themselves differently. You will spend some time each session looking at different themes related to each craft, such as hope, beauty and courage. This course costs £30 for the full 9 weeks and can be paid in instalments. This cost covers the craft materials, refreshments, creche and minibus, if needed, as well as an admin fee. However, as with all our courses, if money is an issue for you, please contact us to discuss options. We don’t want money to stop you from coming along to a life changing course!